VATICAN CITY—Numerous onlookers confirmed that His Holiness Pope Francis could be seen Thursday sprinting along the Holy See’s rooftops, darting between the chimneys and marble sculptures of the apostles atop St. Peter’s Basilica and the Sistine Chapel as he attempted to chase down a suspected sinner. After deftly scaling an exterior fire escape on the Apostolic Library, the pontiff is said to have raced across the pitched roof of the Vatican Museums while closely trailing the fleeing commandment violator, who according to eyewitnesses looked back over his shoulder multiple times during the pursuit to find the white-clad Vicar of Christ just a dozen paces behind him. Reports indicate that the pope lost track of the transgressor against God on top of the Palace of the Canonicate, causing him to pause for several seconds and frantically scan the horizon in all directions before suddenly spying the man on the adjacent roof of the Church of Santa Maria della Pietà, at which point the Bishop of Rome is said to have dashed at full speed to the building’s ledge and leapt the 30-foot gap separating the two structures. 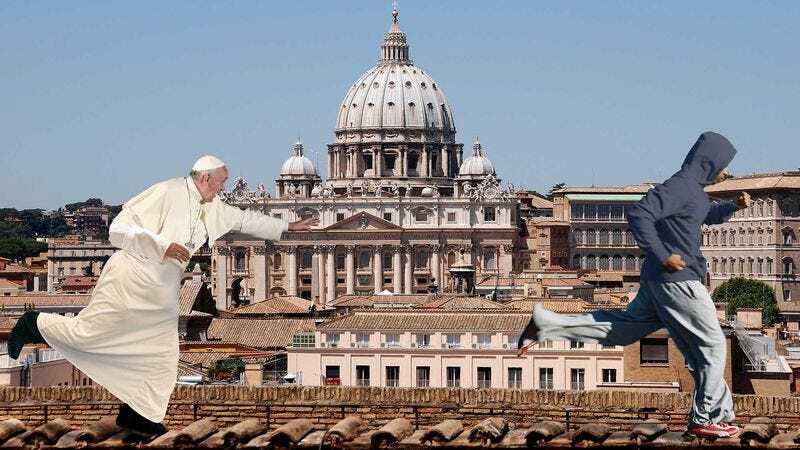 Sources confirmed that after a tumbling landing, the pope quickly picked himself up, returned his mitre to his head, and immediately resumed the chase. At press time, Pope Francis had reportedly taken a shortcut around the Tower of Nicholas V and tackled the unnamed blasphemer from behind, sending them both crashing through a 15th-century stained glass window and directly into a confessional booth below.